The Alas Valley in Aceh province between Kutacane and Gayo Luas, is one of the most beautiful places I have been in Sumatra, with some stunning, intact and accessible forest from 500m to over 3,000m. It is a bit of a trek to reach the area (about 10 hours drive from Medan to Kutacane) but once there you could easily spend a week or more exploring the different altitudes, and there are some nice backpacker-style accommodation options too that can arrange permission, guides and logistics to enter the forest for anywhere from a day to two weeks. I can also provide contact details of a couple of local residents who can help visitors. We focused on the area around Agusan, at the top of the valley (97° 22’ 13” E: 3° 53’ 02” N). Our main objective was to see the elusive Black-and-white or Sumatran Laughingthrush Garrulax bicolor and we were not disappointed. In primary forest at about 1,700 m we encountered a small mixed flock of around 20 Laughingthrushes which included six Sumatran Laughingthrush in company with Black Laughingthrush Garrulax lugubris and Chestnut-capped Laughingthrush Garrulax mitratus and had great views as they hopped and skulked about close to the ground in thick vegetation. This species is now very hard to see as it is heavily trapped for the bird trade. The birds have generally been trapped out from all readily accessible areas, so it has become necessary to get pretty far off the beaten track to see them. For more information see Chris Shepherd’s excellent article in BirdingAsia 8 (Shepherd 2007). I didn’t manage to get any photos of the wild birds, but did obtain a photograph of a captive bird nearby that shows the pretty distinctive markings and colouration of this species. Other birds seen or heard during our short visit included Red-billed Partridge Arborophila rubrirostris, Roll’s Partridge Aborophila rolli, Salvadori’s (Hoogerwerf’s) Pheasant Lophura inornata hoogerwerfi, the extraordinary red Sumatran race of Grey-headed Woodpecker Picus canus dedemi (which must be a good candidate for a split! 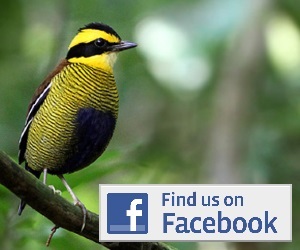 ), Graceful Pitta Pitta venusta and all four Sumatran Laughingthrush species including Sunda Laughingthrush Garrulax palliates. We also saw wild Orangutan and Thomas’ Leaf Monkey. 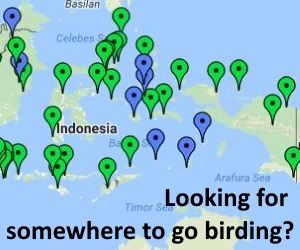 Further exploration in the area would undoubtedly reveal many more of the Sumatran sub-montane and montane specialities. I am very happy to supply further information. Shepherd, C.R. (2007) BirdingASIA 8:49-52.